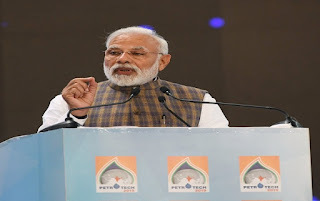 Prime Minister Narendra Modi today said there is a need to move towards responsible pricing of Oil and Gas to balance the interests of both the producer and the consumer. He was inaugurating the 13th International Oil and Gas Conference - PETROTECH-2019 in Greater Noida. The three-day biennial event began at India Expo Mart yesterday. The Prime Minister stressed on the need to move towards transparent and flexible markets for oil and gas to serve energy needs in an optimal manner. The Prime Minister said, winds of change are evident in the global energy arena. He said supply, sources and consumption of energy patterns are changing. Mr Modi said, there is a shift in energy consumption from West to East. He said, there are signs of convergence between cheaper renewable energy, technologies and digital applications. He said, it may expedite the achievement of sustainable development goals. Prime Minister expressed happiness that nations are coming together to tackle climate change. He said, the petrotech has served as a platform to discuss the challenges the world is facing in the energy sector. Prime Minister said, energy is a key driver of socio-economic growth and energy justice is a top priority for India. He said, a Blue Flame Revolution is under-way in the country and LPG connections have been given to over 64 million house-holds in just three years under Ujjwala Scheme.